Next week the results of 2019-20 round of CIF funding are expected, and we are looking forward to hearing once again this year, that our school roof funding bids are approved. However, many academies will be disappointed. As with previous CIF funding rounds, this one will have been heavily oversubscribed, and academies and Multi Academy Trusts don’t always get the best advice. So, if you hear that your application was unsuccessful, why not find out if we can help you with an appeal or reapplication? Were you unsuccessful in the Condition Improvement Fund 2019-20 application for funds? Did your application include repairs to roofs? Is your roof still leaking? Don’t despair! Get in touch to see how we can help you change that. You have a right to appeal a refusal of your application to the Condition Improvement Fund. This is the first thing to consider. Whilst you are not allowed to submit any further information than your current refused application, you can expand on it. However, it is important to put together a reasoned, convincing case. SIG Design and Technology have a good record of successful appeals. With years of experience making dozens of successful applications, we understand the scoring process, and will be able to determine quite quickly whether an appeal is likely to succeed. We’ll review your feedback and your score and see how you might be able to respond in order to receive more points, taking your refusal into a consent. We’ll also look at what proofs you may not have made clear in your original application. Sometimes this is something quite simple to rectify, and it is simply just a matter of experience to spot the opportunities. 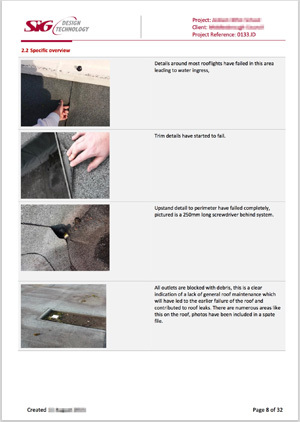 For example, in a recent successful appeal case, we were able to demonstrate why core samples could not be taken from a condemned roof, turning the decision around. But don’t leave it too long to get in touch – you’ll only have until the end of April to lodge your appeal. Why not contact us now? Why use SIG Design and Technology? SIG Design and Technology are experts in roofing and roof related works. We are part of FTSE-250 quoted SIG Plc which means you can have peace of mind and genuine guarantees, and we have an excellent track record of successful applications for CIF funding for roofing related works. We are working with several Academies and Multi Academy Trusts and also advising surveyors practices on their projects. With us on your team, whether you are appealing or making an application for 2020-21 funding, your bid has a much better chance of success, particularly if you start early. Repairs for leaking roofs qualify for CIF Funding – but why did your bid fail? The government’s Condition Improvement Fund (CIF), administered by the Education and Skills Funding Agency, is designed to provide capital funding to keep academy and sixth form college buildings safe and in good working order. CIF funding is ideal for academies who have leaking roofs, as they comply with the priority that the ESFA places on compliance with health and safety issues, and to ensure weathertight buildings and continuous heating. However not all applications for funding for this work are successful, as you may have discovered. Reduced success rates overall. The 2017-18 success rate was just 38% for all applications. Academies who apply are not familiar with the process, or are poorly advised. It is essential that if you need to apply to the Condition Improvement Fund to get your school roof repaired, that you get experienced help on board. This help is Free from SIG Design and Technology. SIG Design and Technology, the company behind FixMySchoolRoof.com, have a highly qualified and experienced team of roofing specialists who also understand how the CIF Funding process works. Use an expert team to help you make your application. Applying for funding is a challenge and people often make mistakes. SIG Design and Technology are roofing experts with years of expertise and a network of accredited contractors. Working with our experienced partner surveyors, we can make the bidding process very simple and successful. Because we’re so confident we can secure your funding, our advice is free and we offer a FREE roof condition survey and report to schools we know we can help. The Condition Improvement Fund 2018-19 funding round might not have gone so well for you. Bidding for CIF funding for your roof repairs can be daunting, but with the right advice and experience on hand it doesn’t have to be a bind. Get in touch with us today to book your initial meeting, or if you have any questions please ask them in the comments below, or contact us via the enquiry form. Read a summary about how our CIF Funding Support works from survey to completion. Read about how we successfully secured CIF funding on a project which had failed in the past. Whether you are looking to appeal or make a fresh bid in 2019, don’t leave it too late, get in touch today!